Apple has confirmed that the current limit of £20 Apple Pay transitions that takes effect when the service launches in the UK in July won't be permanent. If you were hoping to use Apple Pay to buy expensive goods, or even a weekly food shop at your local supermarket, you might have been disappointed to learn that you could only use Apple Pay for transactions below £20 – the same as when paying with contactless debit cards. 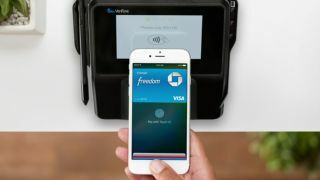 Apple has clarified on its webpage that the reason for this limit is because many of its retail partners are using older contactless payment terminals. Apple Pay can make use of a technology known as "Consumer Device Cardholder Verification Method" which is found in newer terminals and will allow Apple Pay to work with more expensive purchases. Retailers will hopefully move to the newer terminals in the future – though it could be a slow process. If they're a launch partner and Apple Pay is a big hit, however, it might force them to upgrade sooner.